The Pixel 2 is equipped with a 5-inch FullHD display, just like the original Pixel from last year. Unlike the Pixel 2 XL and its LG-made screen, the small Pixel 2 uses a Samsung AMOLED panel. The Pixel 2 is about as bright as last year's model and the Galaxy S8. Unlike the Samsung phone, however, the Pixel 2 doesn't get a boost in Auto mode - the 430-ish nits are as high as it would go. This being an AMOLED display, it's got infinite contrast - the blacks are truly black. Out in the sunlight the Pixel 2 is clearly legible, but we've seen better from Samsung's own. Actually, the 2 XL posts a higher number in our test. That said, the Pixel 2's sunlight contrast is virtually the same as the LG V30's and higher than pretty much any non-OLED display (the Nokia 8 being responsible for the 'pretty much'). A lot has been said and written about this year's Pixels and the screen has turned out to be a rather sore point. We're glad to report that the Pixel 2 doesn't have any of the display issues observed on its XL sibling. We measured an average DeltaE of 1.9, which means its color output is incredibly accurate. The Pixel 2 is as color accurate as the iPhone X and the Galaxy S8 in its Basic mode. Compare that to the Pixel 2 XL's average DeltaE of 3.8. Then, this color accuracy doesn't come at the expense of color liveliness. Regardless whether you've got Vivid mode on or not, the display colors here are not as dull and muted as on the Pixel 2 XL. And finally, it's worth noting that the Pixel 2 doesn't suffer from the blue color shift the XL exhibits when viewed at an angle. The Pixel 2 shares its connectivity package with its XL brother, quite expectedly. That includes Cat. 15 LTE (800/75 Mbps) [3x DL CA, 4x4 MIMO, 256-QAM DL and 64-QAM UL depending on carrier support], 5 bands of 3G (1/2/4/5/8), and Quad-band 2G. 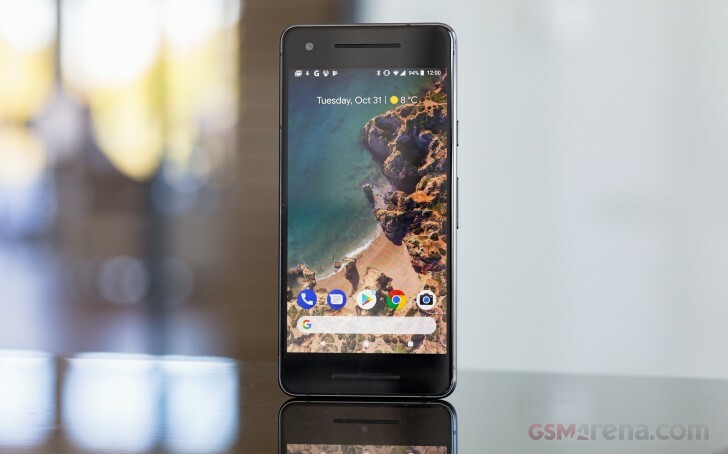 The Pixel 2 supports Sprint and Verizon's CDMA networks in the US and all other GSM carriers in the US and ROW. Both Pixel smartphones are also eSIM compatible for use on Google's Project Fi network in the US. For all other carriers, a nanoSIM slot is in order. There is no microSD card slot in the card tray. The Google Pixel 2 also uses Bluetooth 5.0 + LE, Wi-Fi 802.11 a/b/g/n/ac and 2x2 MIMO. NFC connectivity offers mobile payments through your payment app of choice and communication with other NFC devices, tags, etc. GPS and GLONASS positioning systems are supported. There's a new feature for Wi-Fi as part of Android 8.0. Wi-Fi scanning (usually used when Wi-Fi is switched off to help with location accuracy) is used to detect nearby Wi-Fi networks and will automatically turn on Wi-Fi and connect to a saved network when one is detected nearby. We're not entirely sure how this is much different from leaving Wi-Fi on all the time, but okay. Google has removed the headphone jack for this generation of Pixel smartphones in favor of routing audio to the USB-C port. A dongle is included - yay. The port adheres to the USB 3.1 Gen. 1 spec for transfer speeds up to 5Gbps. Instant Tethering is a relatively new feature that works with other Nexus or Pixel devices including the incoming Pixel Book. A Nexus tablet on the same Gmail account as the Pixel 2 can prompt you to connect to the phone's cellular connection by automatically turning on its Hotspot and tethering to the network. This requires both devices to have Bluetooth and Wi-Fi switched on. The Pixel 2 packs a 2,700mAh battery - not a strikingly large number, but it is a 5-incher we're talking about after all. The iPhone X has about as much juice inside (2,716mAh), while the Galaxy S8 relies on a larger 3,000mAh power pack. The Pixel 2 is quite efficient with its battery usage, at least with the display on, our testing shows. It can loop videos for 11 full hours, and can do an hour more with Wi-Fi web browsing. It's less impressive when it comes to 3G related tasks - the 15+ hours of voice calls are merely okay, and standby longevity isn't spectacular. Even so, overall endurance ended up fine - the 75 hour rating is one thing, but in practice you'd be enjoying the rather good battery life you'd get when actually using the phone. The Pixel 2 comes with a Power Delivery 2.0 charger in the box. The unit takes the Pixel 2 from flat to 100% in 1:50h, while a 30-minute charge from 0% gets it to 43%. Our endurance rating denotes how long a single battery charge will last you if you use the Google Pixel 2 for an hour each of telephony, web browsing, and video playback daily. We've established this usage pattern so our battery results are comparable across devices in the most common day-to-day tasks. The battery testing procedure is described in detail in case you're interested in the nitty-gritties. You can also check out our complete battery test table, where you can see how all of the smartphones we've tested will compare under your own typical use.